Brian Stropolo will not be officiating during Panthers v Saints tonight. How could you possibly call Brian Stropolo biased? ... oh. THE NFL HAS pulled a replacement official from today’s New Orleans Saints game against the Carolina Panthers after learning that he is a Saints fan, according to ESPN. And how did the NFL learn that side judge Brian Stropolo is a Saints fan? It was all over his Facebook page, including the picture seen on the right. A second picture below shows Stropolo tailgating outside the Superdome for what was reportedly a pre-season game this year in which he was not working. Obviously this is a big problem for the NFL who somehow never looked at Stropolo’s Facebook page when they did their background check. How many other replacement officials are die-hard fans of an NFL team that the NFL does not know about? Is this the craziest American football kit you’ve ever seen? 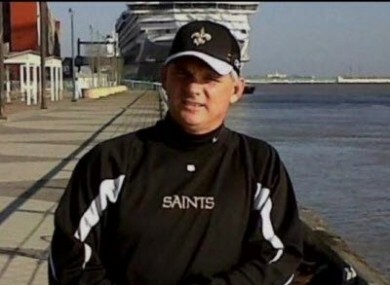 Email “NFL: Saints fan ref removed from New Orleans game”. Feedback on “NFL: Saints fan ref removed from New Orleans game”.